A national leader of the ruling All Progressives Congress, Asiwaju Bola Tinubu, has said restructuring will bring much needed balance to the country. 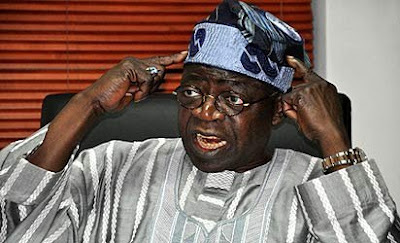 The former Lagos State governor, however, said he was against the split-up of the country. Tinubu’s assertion followed repeated pronouncements by President Muhammadu Buhari and Vice-President Yemi Osinbajo that Nigeria’s unity is settled and not open to negotiation. Tinubu, who was the keynote speaker at the annual dinner of the King’s College Old Boys’ Association, on Saturday, described Nigeria as a nation that had not sufficiently defined its governance. The APC leader said, “We are like the bewildered couple who has got their marriage licence after a lavish wedding; yet neither of them really understands the meaning of marriage or their roles as husband and wife in it. “Legally, they are married but functionally, their union is a crippled one. This couple will be at loggerheads until somehow they forge an agreement on what type of home they want and what are their respective duties in making that home come into existence. “It is a rather curious lapse that a nation with such diversity as ours has not taken the time to give our legal marriage its proper functional underpinning. In other words, we all lined up to call ourselves Nigerians without gathering to discuss what it meant.